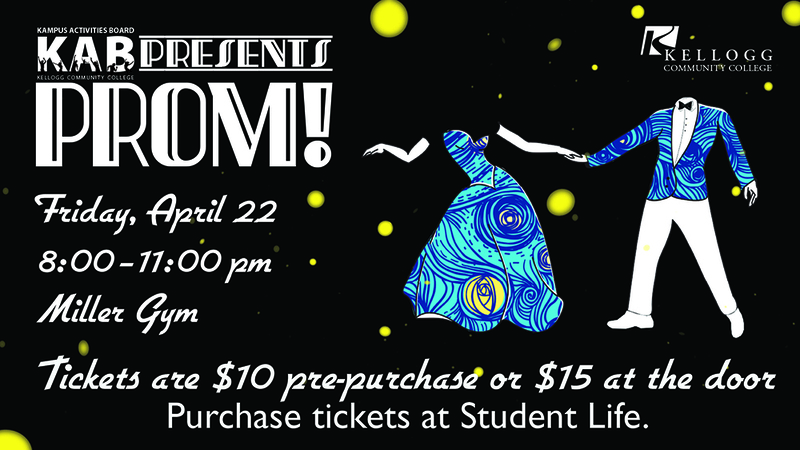 Kellogg Community College students are invited to go back in time for a night via the Kampus Activities Board’s Prom! event this Friday. The event will run from 8 to 11 p.m. April 22 at the Miller Gym, on campus at 450 North Ave. in Battle Creek. Tickets are $10 in advance purchased on campus at the Student Life offices or $15 at the door. The event is open to individuals ages 18 and up. You must be a KCC student to purchase tickets, but each student attending may purchase a ticket for one non-student guest. For more information, contact KCC’s Student Life office at 269-565-2634.